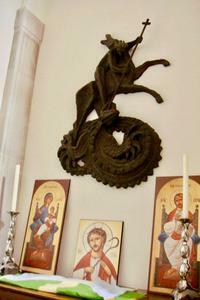 Large bronze abstract relief, wall mounted, depicting figure (St George or St Michael) riding horse and slaying dragon. Wall-mounted tablet bears inscription in gilt lettering. The Times 25 Mar. 1966 p.13 col.a; 26 Mar. 1966 p.12 col.c.